There are songs out there that have seemingly always been there. What would Christmas be without the sounds of “Have Yourself a Merry Little Christmas”? 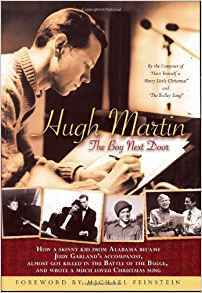 However, according to a report in the Los Angeles Times, the songwriter and lyricist Hugh Martin Jr, who penned the song in 1944 died at his home on March 11, 2011 at the page of 96. The song became famous through Judy Garland’s rendition in “Meet me in St Louis” (whose title song he also wrote). It’s interesting to note that the song received two re-writes. In the first, the line “Have yourself a merry little Christmas, it might be your last…” to “Have yourself a merry little Christmas, let your heart be light…” The song had originally been written in the depths of World War 2. When Sinatra subsequently covered the song in 1957, the line “Until then we’ll have to muddle through somehow,” became “Hang a shining star upon the highest bough.” The song has since become a standard covered hundreds of times.